The buying power of the Second Harvest Food Bank is phenomenal!! Did you know that a donation of $1 is enough for the SHFB to provide TWO complete meals? Cans and other non-perishable donations are certainly appreciated, but you can see the buying power of cash donations. Please consider a cash donation and participate in our food drive. In 2017, we were again for the eighth year in a row, awarded the GOLD service award. We are so honored to have had that much of an impact in our community!! We've had a great time at the Second Harvest Food Bank over the years. One time, we sorted 194 boxes of apples! 5,000 pounds! 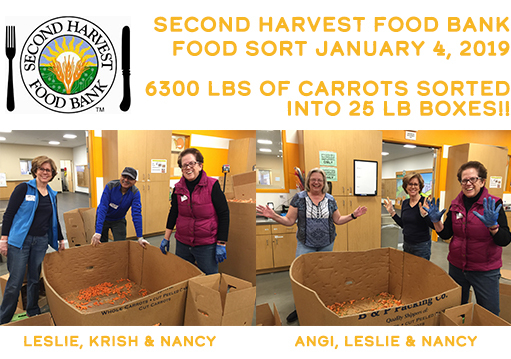 In 2019, we sorted carrots...over 6,300 lbs. of carrots into 25 lb. crates. Below, we are celebrating finishing a pallet. Wow!